Nothing wrong with those who enjoy trying to take a shot at long term guessing/forecasting, but it really shouldn't be accompanied with all the extra hyperbole as it has frequently shown to be so incredibly inaccurate. There are simply too many changing variables to get overly excited about what at the time looks to be a... historic, epic, record shattering, unforgettable, one for the ages, etc upcoming winter season. Think the data suggests that any forecast beyond 10 days is a coin flip at best, so it's definitely hard to justify putting much of any stock into a long range winter guess/forecast. Nature will take its course and we are just along for the ride. Good post. I do believe most of those hyperbolic terms mainly focused on S. Plains/Dixie over to the East Coast. Just today, OKC got hit pretty good and traditionally winter would start there later than the northern tier. I wasn't taking your post as directed towards myself so I'm not offended by any means. Actually, since I made my seasonal call for this sub-forum so dang early I thought it worthwhile to look at just how "historic" I expected it to be. This table shows that my region of south central Mich would finish above avg (my call is for first to last flake to be clear, not DJF) but only by 10-20%. Nothing close to the 100% above normal of our '08-09 & '13-14 historic season totals. My map also did not specify amounts (not even a percentage like WxBell's for example), but merely amount vs average for your particular location. Currently, mby sits at 34.7% of normal on Jan 4th. It's certainly not impossible if things do flip that I come in at or even above avg. Actually, if we can just get that Iowa snow hole caught-up, my early call may yet turn out ok. Let's see how things play out..
For sub-forum in general. Actually it's Zone 2 that I had as above avg, so places like IND and a lot of the OHV are currently running behind. N Iowa I had a Zone 3 thus below avg. I doubt they go all winter with bad luck tho. Agree 100%! This is so true and I couldn't have worded it any better! Nobody really knows what the weather will be like beyond about 2 weeks or so. But still it's fun to look at models, though I don't pay to much attention beyond 7-10 days except to see what a general trend might be. Also still like when people try & forecast the weather, be it long or short term, & see what they are seeing/thinking. Model forecasts are generated by the world's most powerful supercomputers and still have issues. Last fall I was a little worried how I was going to make it through this epic late 70's style winter and still keep my livestock comfortable. Needn't have worried as it was mostly opposite so far! Now I'm worried (not really lol) that it will change (patterns often don't continue the same all season long) and be bitterly cold right when I don't want it. So long as it happens before February 20 I'll be okay with it! Very well said and I agree 100%. 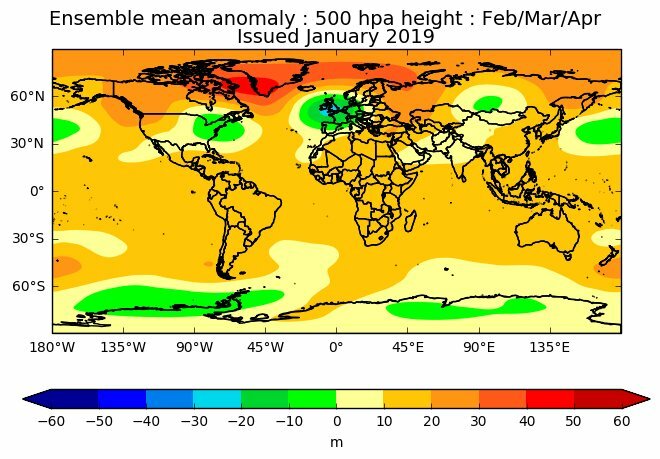 As if there is nothing to discuss, I thought I'd comment on the UKMET and EURO seasonal which both agree that this Winter is locking and is poised to have Legs. Here was the 500mb map for Feb/Mar/Apr...I can't post the Euro, but it is also showing a very cold Feb/Mar for the eastern CONUS. This winter is all but over for me if the models are correct. Extrapolating out to the period past the "cold shot" that may or may not happen, winter looks to largely cease for anyone who isn't the great lakes or the OV. This one had all the potential. It's a shame. Going to be hard to squeeze much winter into the last 15-20 days of February if the cycle is locked. I think it is. If there is severe cold, it will be nothing more than an annoyance to me. I hate that. Also, plenty of us enjoy spring weather as well, so I don’t see the issue. I haven't had a winter (with exception of almost having a winter in October and November, VERY VERY cold) so if it's going to be spring, may as well. College baseball and NASCAR start soon. I'm going to stick with the established seasonal pattern, though and go with more alternating extremes with the SW jet finally waking up as we go -PNA for a bit. Still looks like hard cold into the spring months for almost everyone but me and Andie. You see, unlike all of you evil people who wish extremes on folks just for your silly hobby — I am just fine with a normal winter day or a normal summer day. A few inches of snow to pretty things up? No problem for me. 78 degrees and sunny? Can’t wait to take a lap around the lake and drink a few beers. What I don’t need? Ice, record-low temps, feet of snow, humidity and tornadoes wiping out entire towns. You know - the things ya’ll hope for and cherry pick, post and root home any/every model that suggests it might happen. You drink and boat....my gosh man how do you live with yourself! Decisions that put others lives and yours at risk! Happens all over the south. I've sailed and had a beer or two. We're not talking about getting bombed. Just a beer. Nice lake sailing. . Y'all come. Yeah, I thought we'd catch the tail of this cold streak, but looks like another dull winter. Loads of overcast days. Even our rain has abated. I'm ready for a good old rainy day, much less snow. Lets talk spring and summer! This topic was started two months before meteorological fall but here we are a week from meteorological spring and not a peep? Sure looks like the first week of March is going to be cold all over but it doesn’t look to last long. Seems by Week 2 we may be looking at ABOVE AVERAGE temps which will be amazing considering how average skyrockets over the next six weeks. Like any spring, we’ll have our ups and downs but I am definitely ready to open the windows and get some fresh air running through the house. A nice long run outside sounds amazing, as well. Welcome to the board! A lot of this board centers around Winter weather. You'll notice that as Winter dies down so does the board. Some members (like me) hold out during the Summer talking severe wx and miserable heat waves, though. Usually long-term discussions for anything other than Winter tends to happen in monthly threads. As LNK stated, Welcome. I'm beginning to notice the days lengthening and thinking about spring also. I think I'm ready for it too. I'd be in a different mood about that if it were white outside for any length of time at all this winter, but it hasn't been. Here's hoping for a safe severe wx season but my belief is that it will be a difficult one in the South-Central, deep south, and SE US. Just an early 2 cents worth. It's been calm for many seasons, in spite of press coverage, and the weather pattern that typifies a transition into the summer from this pattern is usually violent. I am ready too, if only because real winter had a hard time gaining any traction here compared to better years. Due to the many cloudy days us Mitt peeps endure from mid-Oct thru Feb, I'm a huge fan of Solar Summer and we're only a month away! I like severe weather also. I used to love it when I was younger, back when SMI got a lot more of it, and my folk's place was built like a fortress strong. These days, there's little to get excited about, and when it does hit it's always a lot of mess to clean up here in Marshall. An older city with too many large, old, and over-grown trees. I agree. It seems like back then, t'stms used to be more severe and if we end up getting anything close to strong or even severe these days, it ends up dissipating right before it hits our BY's. Weird stuff. Too bad we had to lose December. Total waste, down the drain and half of January as well. Winter kicked in a little too late, but as they say, better late than neva. The odd thing is that just to my north. And I mean only a county or two. They've managed to avoid the total torch-offs and have actually had quite a nice snow cover going for some weeks now. 94 counties have been like the cut-off between the haves and have-nots this winter. Bummer. That is like a stab in the back. Also, not sure why the NWS has avoided to add a WSW thus far this Winter. They are just hung up on WAA for some apparent reason. I.E., back in January, the snowstorm in my area gave me more than 6", which is WSW criteria. Another I.E., is the previous snowstorm (just a couple of days ago) which gave me 6.6", meanwhile, I was in a WAA. Total BS and yeah, I'm calling it what it's been. This county (Calhoun) has been hit four times with 7-10" and not one single Watch or Warning for any of those storms. We finally got a watch for this windstorm (dumb), and the warning that they did trigger (after-the-fact) for end of January ended up missing us entirely. I think monkeys tossing darts would score better with headlines here! I know it belongs in the rant thread, but being robbed of proper headlines when they were due, is 50% of the heartburn I have with this winter. This is impressive for us this winter. This write up came from Hastings NWS yesterday. LONGEST STREAK AT-OR-BELOW FREEZING IN DECADES? which would bring it up to at least 22 days! days, way back from Jan. 23-Feb. 21, 1936. Thanks for sharing this. Impressive indeed. A bit surprised to see Western WA below normal considering they had that one week where they got a relentless amount of snow. Wow, below normal precip winter out towards the panhandle. 13.9" for DJF in Scottsbluff vs. 46.1" for Omaha. Usually that would be the other way around. Scottsbluff is typically a bit warmer and drier but rain is basically unheard of in the winter. And look where it's been average to dry..